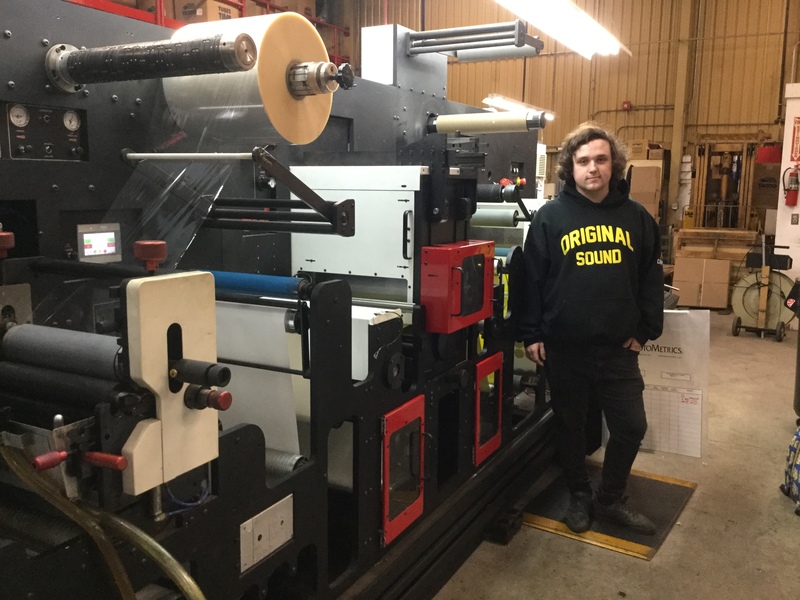 Presses were running full steam when we met with YouthBuild alumni Matt Guilmette at Creative Labels of Vermont (CLOV), where he runs the CEI Finisher die cutter. After leading us around the press floor, describing the various machines he has worked on, we sat down to discuss his transition from YouthBuild to employment in 2016. CLOV General Manager Lee Lachance praised Matt’s work ethic, saying he had the basic skills they look for when he was hired, eye contact, attention to directions, follow through, and it has been a great fit. After two years, Matt has mastered almost all the printing equipment, as well as taken on a leadership role on the second shift. Running the CEI finisher machine is Matt’s favorite job responsibility so far, although second shift work hours can be challenging in the summer. While missing out on warm, summer nights with friends is tough, the schedule becomes worthwhile in the winter when he can snowboard during the day before his night shift. Matt didn’t pay much attention in traditional high school, but found a lot of support in the YouthBuild classroom. He credits his YouthBuild experience in influencing his career path by teaching him the social skills needed in the workplace and by doing personal and professional development activities. He added that the construction knowledge, and his OSHA certification, have carried over to his position at CLOV. “All of that saved me from falling off,” he explained. What advice would Matt give to current YouthBuild students?